Answer: A rigorous best practice assessment of one of the most fundamental but least understood company processes. Like a personal health check, it is far better done before any acute problems arise and is only of value if corrective measures are identified and then acted upon. Even if we feel fit, a regular check-up is advisable to catch anything a bit odd early – and so it is with a sales audit. - Actual sales achievement versus target by month or quarter over time. - Forecast accuracy – both under and over – not just by value, but by situation. - Correlation to any “percentage chance” weighting – gut feel or parameter-driven. - Average and trend lead time to order. - Conversion rate from acknowledged lead to sale. - Churn in salesforce personnel. - All of the above for channel business. Any adverse readings will in turn point to elements of the overall sales process which merit further attention. In some instances this may already point up a key issue – the absence of a common approach. In good times a band of enthusiasts using their natural instincts to “make the numbers” may seem to deliver, but this might build up long term, systemic problems. In particular, without a process there is nothing to manage, merely individuals. The audit will also highlight potential breakages in links to other areas such as lead generation programmes, HR-driven individual performance improvement, or marketing and sales collateral creation. 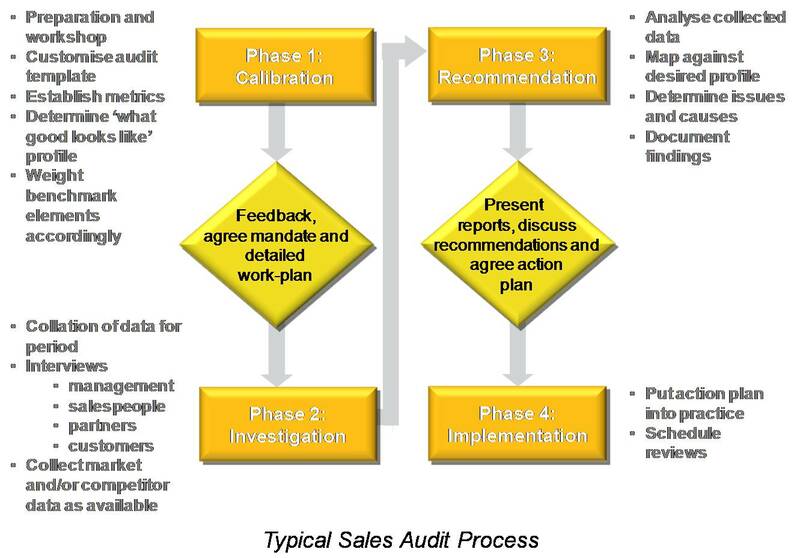 A powerful sales audit will interpret the diagnostic output to devise a prescription of remedial actions which must be pragmatic with measureable success criteria to monitor progress. For example, it might be necessary to pull together several discrete activities into one process with clear dependencies. Once that is in place it would then be possible, for example, to reinforce it by revamping sales reporting formats and devising coaching programmes for both sales team and management. Regular maintenance ensures maximum effectiveness from any high performance engine – including sales – so it would be wise to schedule an annual audit, just as for accounting.